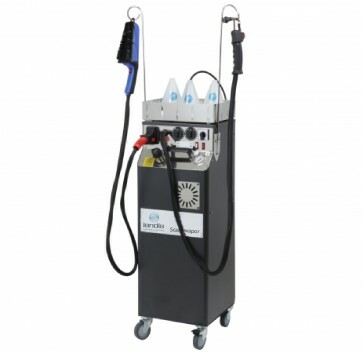 Steam generator for the cleansing of the shoes "ScarpaVapor"
The Landis ScarpaVapor - is a professional, strong and reliable steam generator, whose main function is the complete cleaning of shoes, inside and outside. Using Scarpavapor, the operator injects steam and detergent, then, thanks to the provided speacial brush, he can dissolve and remove even the most stubborn dirt from the shoes' surface, obtaining a fine result. This generator provides a high-quality shoes drying and sanitization. The hot air drying is quick and restores softness. The ozone lamp eliminates bacteria and bad smells, thus entirely sanitizing the shoes. Scarpavapor can be installed in smaller places and does not require any water system for the draining.